Not long ago, I posted on my plans to read faster, based on an article I’d read about speed-reading in Success Magazine. The technique involved a finger scanning method, which is a permutation of one of the older speed reading techniques called meta guiding. More recently, there’s been a lot of internet interest in speed-reading helper apps, particularly because they can be purchased so cheaply now, and are on our mobile devices. I’ll profile some below. Is Speed Reading all it’s cut up to be? 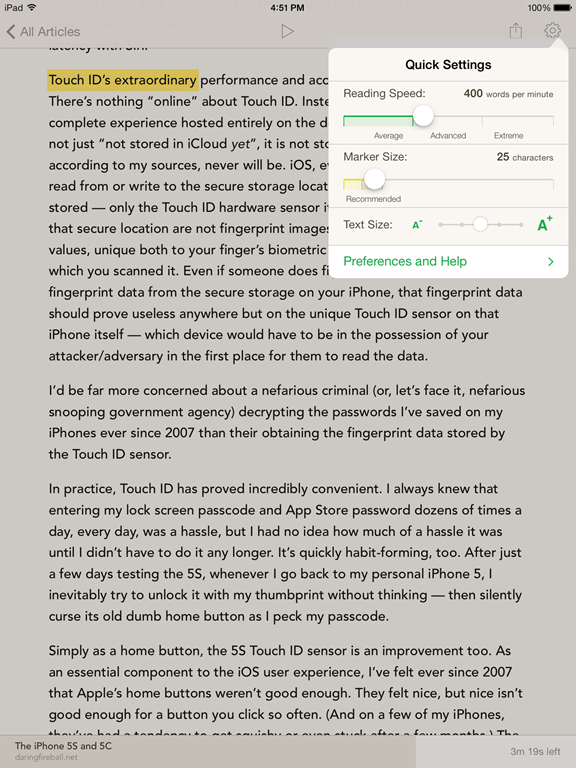 I do read quicker using the finger scanning method I started using over Christmas. Using a meta guiding method, I get rid of distractions from the page. BUT. I find the scanning works better for non-fiction texts and articles – especially those read on my tablet or in physical book or magazine form, and ones that I don’t necessarily need to fully comprehend – ie. the many browsables that our world is full of nowadays (like, perhaps, this blog post). I prefer to let myself read slower, perhaps meander when reading fiction, or full on instructions I need to comprehend. This evidences one of the latest Life Hacker articles which goes into the many types or methods of speed reading, and what has or has not been found out about the claims some of these apps are making. 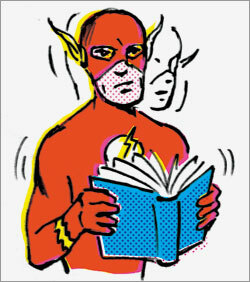 Required reading (as fast or slow as you like) – The Truth About Speed Reading (Life Hacker). 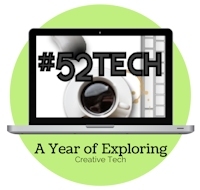 So saying all that, for a lot of my reading now, I will benefit from training myself to speed up my reading, becoming a browser reader – somebody who can pick out the crucial information in the many blog posts or newsletters I follow. And perhaps you could too? The average person reads at 200-300 words per minute. 110 wpm, slow reader, but you have many possibilities for improvement. FReader will provide rapid comprehension and speed increases. You will soon realize that reading can be a pleasure. FReader will give you hours of instructions and training so that you keep improving up to top level reading performances. 240 wpm, oral reader. You may rapidly and significantly progress by suppressing subvocalization. FReader software is perfect for you. 400 wpm, auditory reader. 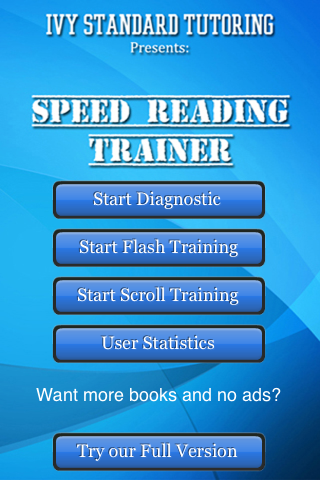 FReader provides several speed reading modes to pace your reading beyond this sound barrier of 400 wpm. 1000 wpm, visual reader. Your reading speed is the gem of your CV. You don’t need FReader but it could certainly be useful to members of your family, who are not such accomplished readers. The average user is an oral reader – meaning they voice the words inside their head. That’s me, too. The following apps for speed-reading attempt to beat that subvocalisation with flash text methods – flashing one or more words at a time in quick succession. This one-word-at-a-time technique is called RSVP or Rapid Serial Visual Presentation. It’s a technique that is particularly good on small screens like smart phones. Note that at this point, these apps don’t support reading ebooks, or PDF files etc (correct me if I’m wrong on some). Most don’t supply thorough statistics or reading rates also. To allow a change in reading speed, increase your own speed in these apps over time, forcing you to read faster, even on static pages. Outread and the following app, Syllable, operate by reducing subvocalisation – which means reading at a pace which is faster than our minds can say the words. Outread starts by highlighting words in a paragraph, then slowly speeds up those highlights, so that you are forced to move through the text at a faster pace. This is a meta guiding technique – you still see the entire text page around the highlighted text. You can customise the speed, the list of key words the app will highlight and choose from other font and theme settings onscreen. Text can be pulled in from read later apps such as Pocket, Instapaper or Readibility, and also a bookmarklet can be inserted into the Safari iOS browser to directly save an article into Outread. The universal app sells for $5 at the Apple appstore. Syllable for the iPhone also uses subvocalisation methods, by quickly pacing through the text (by flashing it word by word in the centre of the screen) so that you don’t have a chance to read every word. This is a RSVP technique. Once you get to faster speeds you can start choosing how many words you are shown, in another method called chunking, allowing you to only read certain words. Fonts and modes can be changed in settings. As with Outread, Syllable is integrated with Pocket, Instapaper and Readibility but also can use clipboard articles you’ve just clipped. Syllable is available for $3 from the appstore. Velocity uses the same RSVP one-word-at-a-time technique to inhibit subvocalisation as these other apps. It is integrated with Pocket, Instapaper or Readibility and can take text from the clipboard or an installed “Read in Velocity” bookmark. Microsoft Office Word documents can also be imported into the app. Although Velocity sports the typical changes you can select from in screen modes and font sizes, it also includes a special font created to aid those with dyslexia. 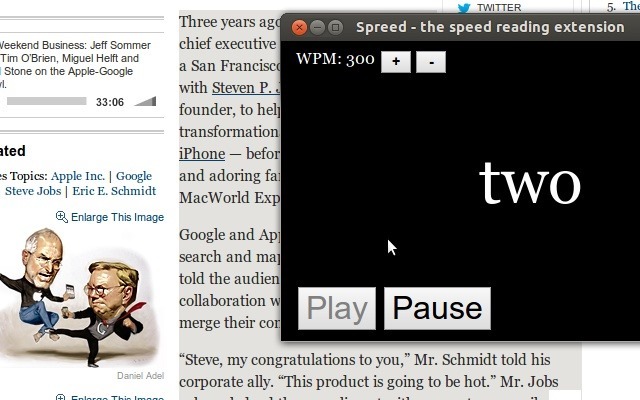 Velocity starts the reading out at 300wpm which is adjustable with a slider at the bottom of the screen. The app is available from the appstore for $4. Spreed offers similar RSVP attempts to break down your subvocalisation, via an extension in the Chrome browser. It’s simply a matter of selecting the text you want to attempt to speed-read, right-clicking and choosing “Spreed selected text”. A popup window is ready to go with the text inside – click “Play” and each individual word will flash through the app. You can change the speed, amount of words shown and font size. The Spritz app makes some hefty promises of taking users up to over 1000 wpm, using anti subvocalisation techniques, not just RSVP but ORP – optimal recognition point, which picks out the fixation point of each word in red. 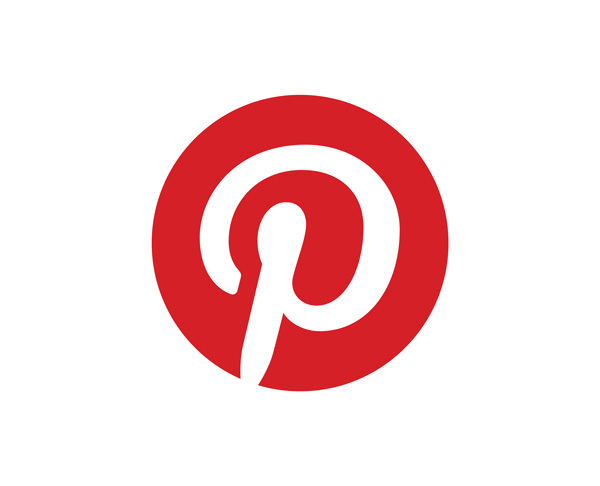 This Huffington Post article on Spritz explains a little more on ORP and provides some embedded gifs showing reading at certain speeds. (From which the image here has been taken). You can play with the spritz tool yourself and read more about the science behind these techniques via the Spritz website (below). This free app for Android users promises to get your reading up to 500wpm, using a meta guiding technique. 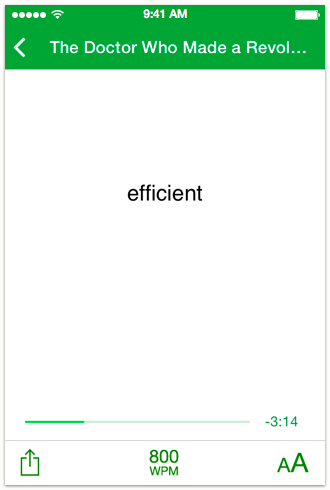 This is a training app, so does not support using your own text – instead, a small collection of public domain content is provided to read through. Statistics are generated as you progress through the training. 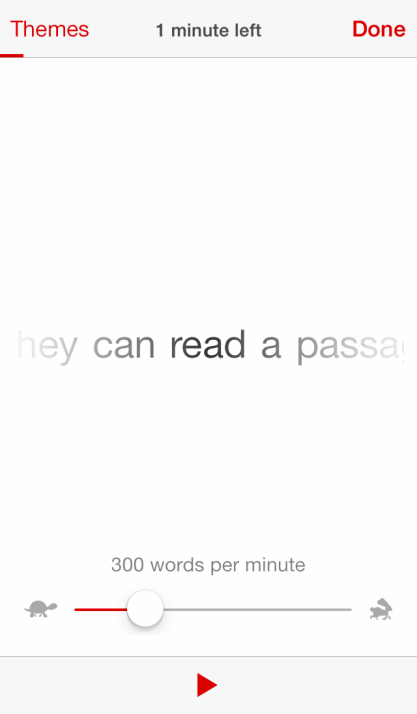 Acceleread is another speed reading trainer, available for iPhone and iPAD. This initially free app supports Dropbox integration for importing in ePubs to read as you go through the training program. Once you’re in the app you’ll need to upgrade via in-app purchases to enrol in personalised training programmes based on your goals, and which support some of the following features. Statistics are given on your progress. Acceleread attempts to gamefy speed reading by giving you sharing abilities to boast to your friends about your progress, and providing stars and trophies as you reach goals on your charts. Image Credit: How to Read a Book in One Go – Wired Magazine, September 2011.